I have been watching your resto as I too am restoring a series 1 2+2 originally from the USA and a basket case. A lot of the problems I have had are similar but many of mine relate to getting it to a concours standard and not the even more difficult resto you propose. 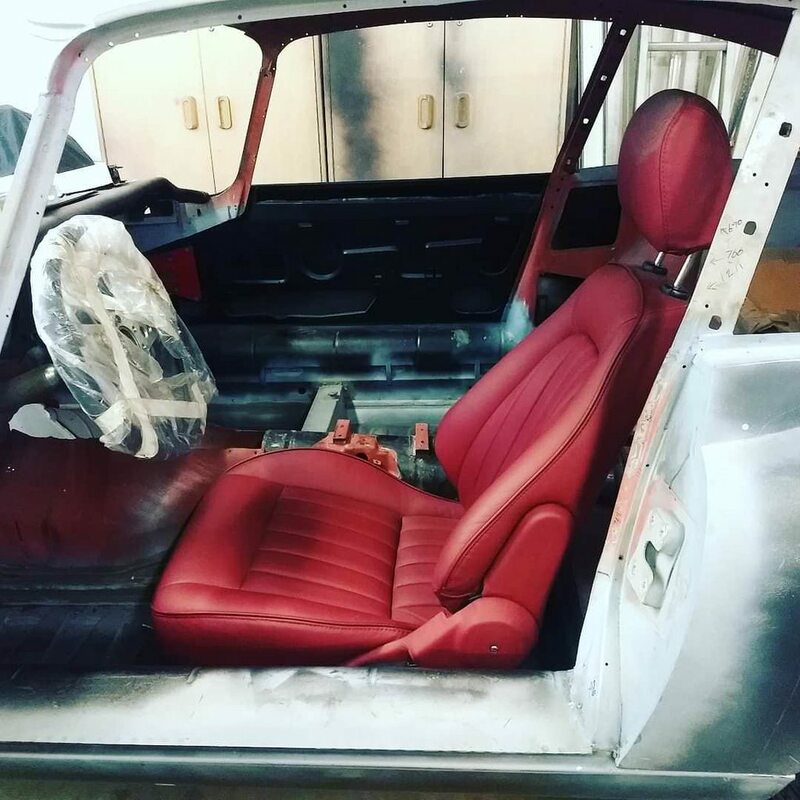 The costs of everything have been eye watering and I have been misled many times along the way but the car is 3 years in and close to completion. Firstly there were some great straight six engines in the Nissan world from 70s and 80s. These on the face of it had similar dimensions but I have no idea about exact dimensions. The RB30 engine used in the Skyline seems to be a bit of a legend. Secondly I am scavaging for a few last parts. I was wondering if you are keeping your back seats in the same format. My restorer has lost the rear seat hinges that allow the seat back to cantilever forward and back to give more space. I thought if you were going for a modern arrangement you might like to get good money for your hinges. 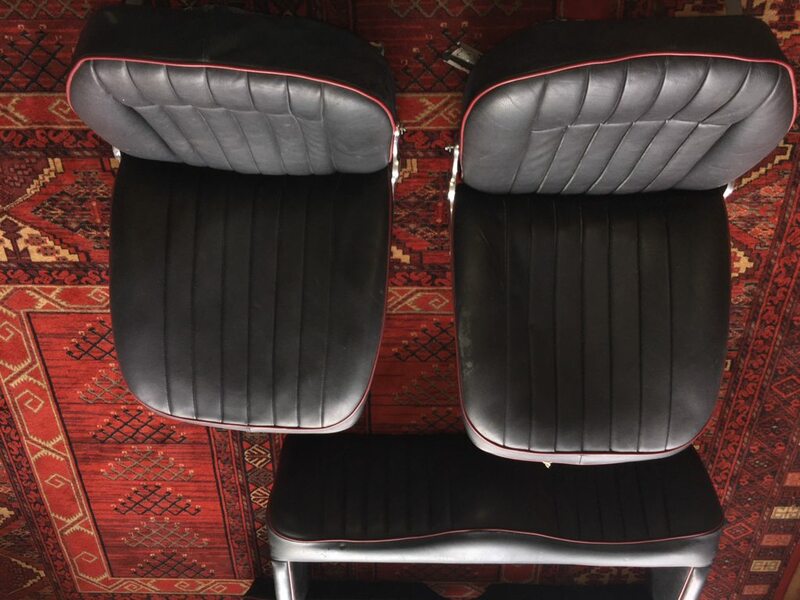 I’m sorry but I exchanged my seats for a very classy pair of MX-5 reupholstered seats that someone was taking out of his E-Type. However, I don’t recall whether the springs/hinges were attached. I’ll ask Steve to take a look as everything is bagged and tagged. We’re you asking about this on the E-Type Forum, which seems to be down at the moment? Yes indeed I was asking on the etype forum. The hinges are on the rear seats at each side of the back rest. Basically its like a heavy steel parallelogram about 12 inches long. If you are fitting your rear seats back then you will obviously need them but if you are fitting seats from another vehicle such as BMW etc then you wont. Chris, I'll ask Steve if the hinge thing is still there. I found a set in the states but the guy has been awkward about posting to the UK. Progress in October, 56 more hours in the shop. First there was the work in stripping / prepping the AJ16 engine and removing the transmission from the engine block. Then hoisting the engine and trial mounting into engine compartment – only to find, as reported above that there were clearance issues which would entail either cutting into the bulkhead or making changes to the engine frame. Neither is acceptable if the car is to be accepted as original by the DVSA. Hence the hunt for an alternative engine and transmission. Steve has also been working on positioning drivers seat and measuring me up during one of my visits. 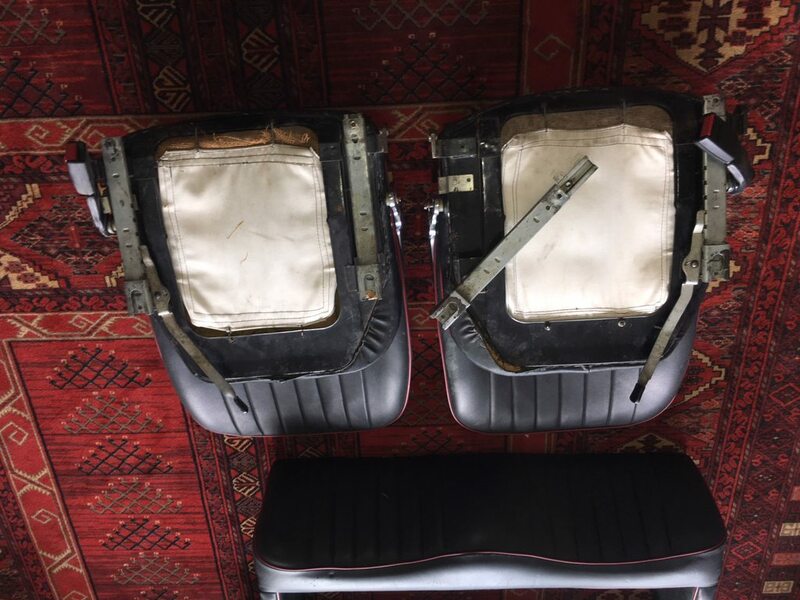 I had sourced some original E-Type seat runners which were more or less OK but one piece was missing. So there was work on fabricating complete new towers for seat runners – utilising the original front seat mounting pegs and machining up spacers and then welding them into the frames. Fabricating spreader plates and welding them to floor – positioning and welding the seat towers in. The seats I've mentioned before are based on expertly reupholstered Mazda MX5 seats. I managed to find a pair which I exchanged for the originals from mine. These are superior seats in terms of comfort, lateral restraint and safety than the originals. They should make long journeys or hard cornering so much more enjoyable than the frankly rubbish originals. Looking forward, I'm still trying to source a new engine and gearbox but have been hampered by life intervening - work and managing building work in Italy. But I may, if lucky, have something to report shortly. I think it is down to a shortlist between a BMW-based straight six, preferably an Alpina (I'm on the track of a M50B30) or M version (I'm going to look at a S50B32), or a JDM-based 1JZ-GTE or 2JZ-GTE. I am hoping to source all the bits from the same car so that I have less risk in compatibility. I have also been pondering the bullet proof Mercedes M103 3.0 litre engine that I had in an old Mercedes SL. They are amongst the greatest of straight sixes but maybe not as tuneable as the ones above. I had considered the Mercedes Cosworth 2.3 but I don't think it would be torquey enough for my tastes. Incidentally, I am not a BMW expert at all, and I may have been overly dismissive of them in past as my only experience of them has been rather asthmatic hire cars which were not comfortable or pleasurable to drive. Having driven some rather better spec ones, I begin to see why many people love them. Anyway, I don't have time to explore the many 3 variants but some seem more appreciated than others. I've heard a lot of love for the M50/S50 engine from the E36, for example. But others seem to love some of the E46 range, and ttc6 is pointing me back to the M30! Regardless of model, I understand that an Alpina or M3 BMW will have considerably more oomph and suspension mods etc than others, but is there a really appreciable difference at other points in the range, say, between a 330ci Clubsport and a normal cooking 330 or 325? It seems a lot easier to find a good one of these than an M3 that hasn't been ragged to bits, if I wanted to buy a whole car to cannibalise. I also get confused with the various M Sport designations - are these like the difference in Mercedes between an AMG proper and the AMG line? Is there an idiot's guide anywhere for this bear of relatively simple brain? The bimmerforum seems to expect full innate understanding of the range/engine designations etc . The last option is the most boring and safest which is to put in an XJ 4.2 engine and MOD gearbox and be done with it. No compatibility issues but no real challenge either. ".....Is there an idiot's guide anywhere for this bear of relatively simple brain? The bimmerforum seems to expect full innate understanding of the range/engine designations etc ......"
So first thing, there's only really one simple distinction - if it's not a proper 'M' car, it's a cooking version. By this I mean 'M-then-a-short-number'; M3/M5/etc. Traditionally an 'M' was pulled aside from the main production line at the Body-in-White stage and taken to be hand built. I think the last one built in this way was either the E34 or 36, but I could be wrong. A proper 'M' has an engine loosely based on a cooking version, but bespoke for and only installed in that 'M' car (give or take a couple of exceptions for small markets, etc.). An 'M' also comes with its own suspension geometry, arms / bushes, brakes, gearbox, bits of chassis stiffening in places, extra cooling, things like that. Bit racy at an overall package level. Everything else with a BMW badge is pretty much just a trim level on the same basic car. In that I'd include 'Sport', 'M-Sport', and the halfway house 'M-then-a-long-number' cars such as the M535i (E28-era) and more modern M140i, etc. In here you're going to find your normal range of power outputs, gearbox options; and on the sporty trim levels some stiffer dampers and bigger wheels, cosmetic trim pieces and bodykits. In earlier times, a 'Sport' model only came with one engine option (E34 535i / E36 328i for example [okay there was a 525i Sport as well, but that came later, didn't last very long, and nobody likes to mention it...]) and then later, as 'Sport' gave way to 'M-Sport', they'd allow you to have that with any engine. 'M-then-a-long-number' cars are like an aspirational 'M-then-a-short-number' car, built on the basic cooking version but with one, high-output, engine option. Good for skids and the traffic light grand prix, but don't expect to put in more than 3 laps of Donny without the front brakes going all wibbly. In E46 speak, CI just denotes the fact that it's a 2-door, and the Clubsport I think was just a UK-only thing that had all the Halfords tat from the accessories catalogue chucked at it. I leave Alpinas to the end because they're officially a separate marque now. They have history in racing BMWs, and then tuning the road cars aftermarket, but I believe now just offer their own hand-built cars. Back in the 80s and early 90s they had a bit of a transition period where you could pay a dealer to stick an Alpina kit onto say a regular BMW-built 'Sport' or 'SE' model, which is where the difference between a 'B3.5' (dealer-fit) and a 'B10 3.5' (Alpina-built) lies, for example. As I understand it the Alpina cars are now much like the old 'M' cars were - taken aside at BiW and hand-built - or at least, I hope they still are! Unlike the 'M' cars though, Alpinas are much more closely related to the basic car. The conceptual distinction between an Alpina and an 'M', whilst both 'developed' with bespoke engine, box, suspension, brakes, etc. ; is that an Alpina is not really intended to go to the track. Think of an Alpina as primarily a luxury, long-distance GT car, and you get the picture. Albeit, a German take on a luxury, long-distance GT car - which means not laid-back or soft by any stretch of the imagination. Clear as mud I hope! Tom, thanks. Very clear indeed! So, broadly, if I'm stuck with a narrow/tall six cylinder engine choice, the M3 or the breathed-on Alpina are the ones to go for if I want more than around 230bhp? Or I'm into supercharger/ turbo territory or stroking the engine? Up at that level of output, I'd say so yes. The M30 can get there, the b34 is about 220 standard I think. If you're prepared to go for standalone engine management, forced induction, or both, that could be blown away quite happily. It's the compression ratio and the K-Jet that holds the older engines back. Bear in mind that if going down the M3 power unit (S50/54) route, you'll be getting your power at 8krpm+ and you might have fun getting an auto to suit. The paddley SMG option is crap, you don't want it in a road car. Or a a track car. Any car. Put that box in the bin. Sounds like you want the Alpina!